I remember when I was a teenager I hated eating red meat. No I was never the teenage humanitarian that was vegetarian/vegan but just a regular picky eater. Steak is one of my father’s favorite meals so we would have it regularly, which meant for me I kept large amounts of spinach in the fridge so that I could make my own dinner (yes I was so picky to the point where I pretty much only ate spinach instead of most meats). Thankfully I grew out of that phase and realized that I was missing a lot of really great food. 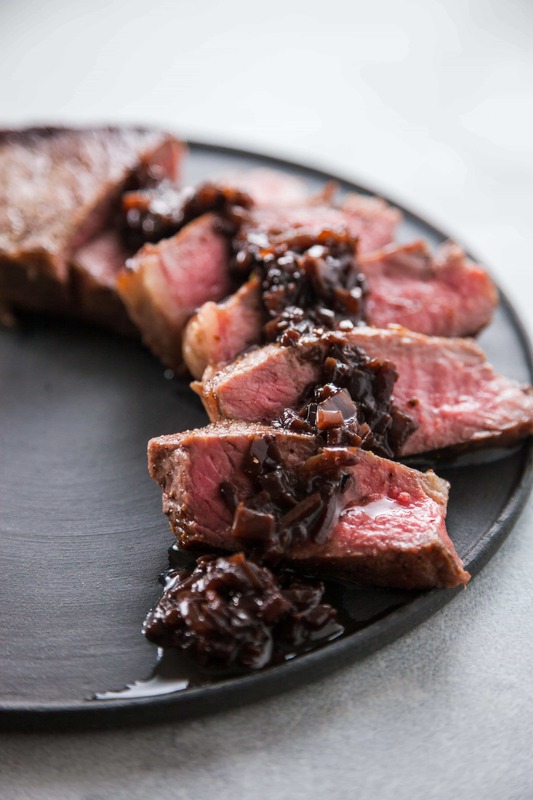 I’m so happy to share my recipe for New York Strip Steak with Red Wine Sauce. 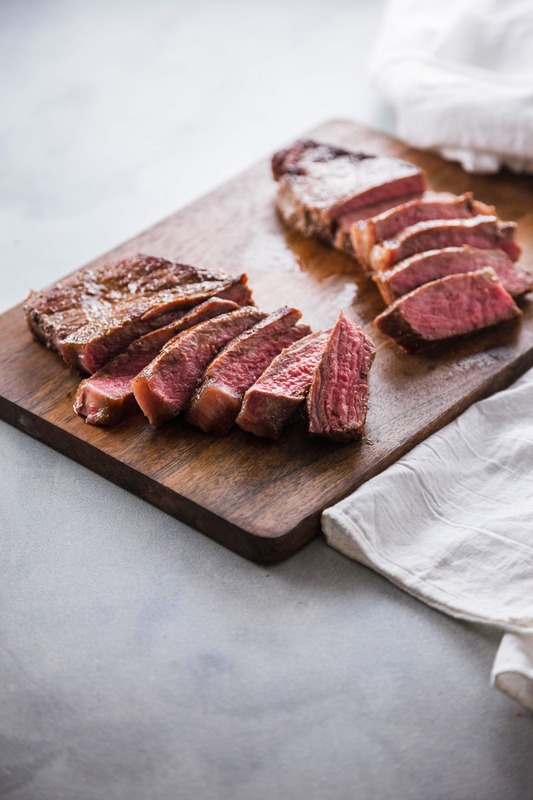 A NY strip is a type of loin from beef. It’s a cut that’s known to be very tender which is why cooking it is easy and very popular. Like most cuts of beef, it can hold up to a lot and a large variety of seasoning. 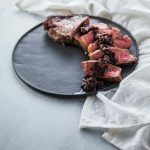 In this recipe the steak is only seasoned with salt and pepper, which is still absolutely delicious. I served this meal with mashed potatoes and asparagus. Most hearty vegetables will pair well with this meal especially roasted brussel sprouts, roasted carrots, or even pureed sweet potato. Like its seasoning, steak can pair well with most vegetable sides and pairs especially well with roasted vegetables. Like what you see? Remember to save it and pin it for later. Let me know if you need anything in the comments section below! 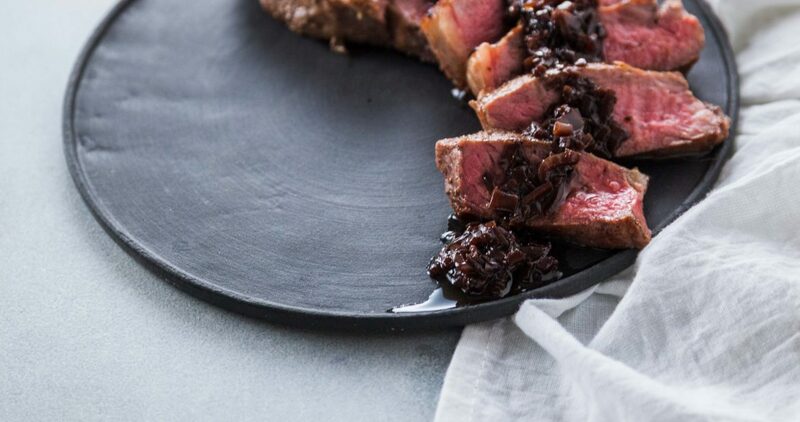 Make date night special by cooking at home with this New York Strip Steak with Red Wine Sauce recipe. You'll fall in love with this meal! 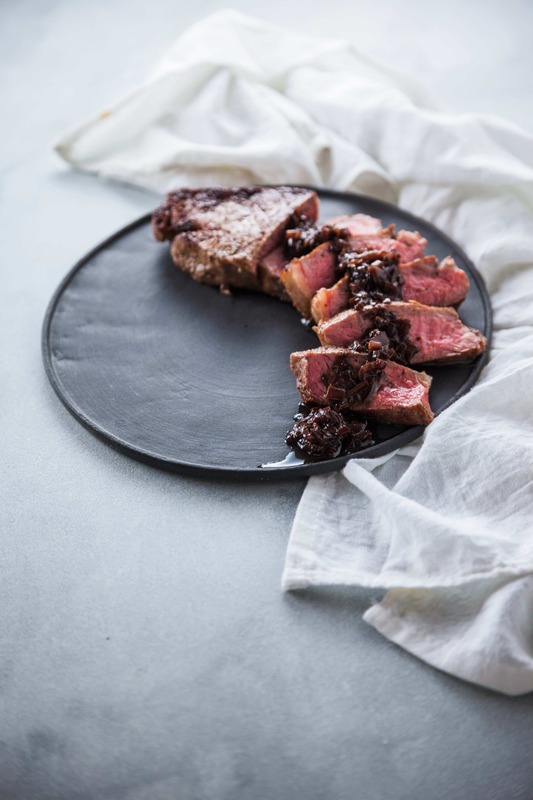 Let steak come to room temperature then season with salt and pepper. 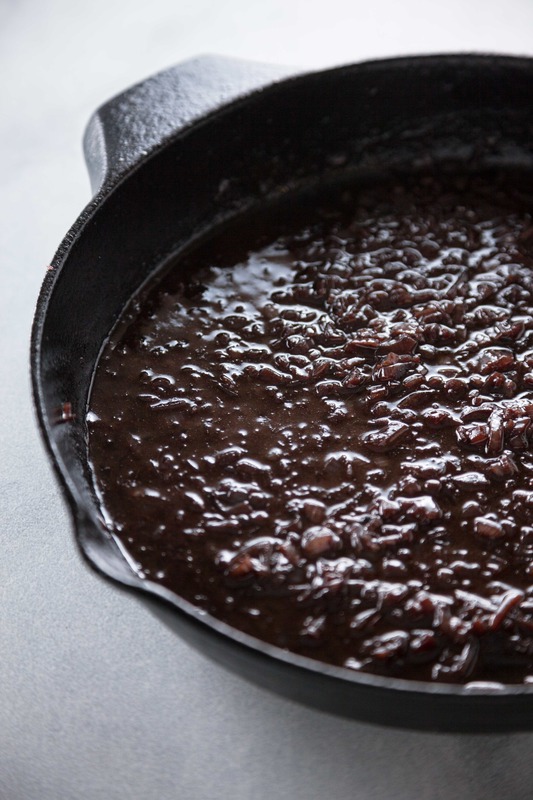 Cook steak in a cast iron pan on high heat. Cook for about 4 minutes per side and make sure to put fat side down in the skillet for several minutes to render the fat on the side of the steak. Remove steak from pan and reduce heat to medium. Add shallots and cook in drippings until softened and translucent. Add in wine and bring to a boil. Cook for 5-8 minutes or until the liquid has reduced by half and thickened. Whisk in butter one tablespoon at a time or until sauce has a glossy velvety consistency. Serve over steak and enjoy!